You’ve said ‘YES’ to your partner and ‘YES’ to the dress, now the next most important task is to select your wedding hair and make-up! Choose a look that compliments you and your personality. 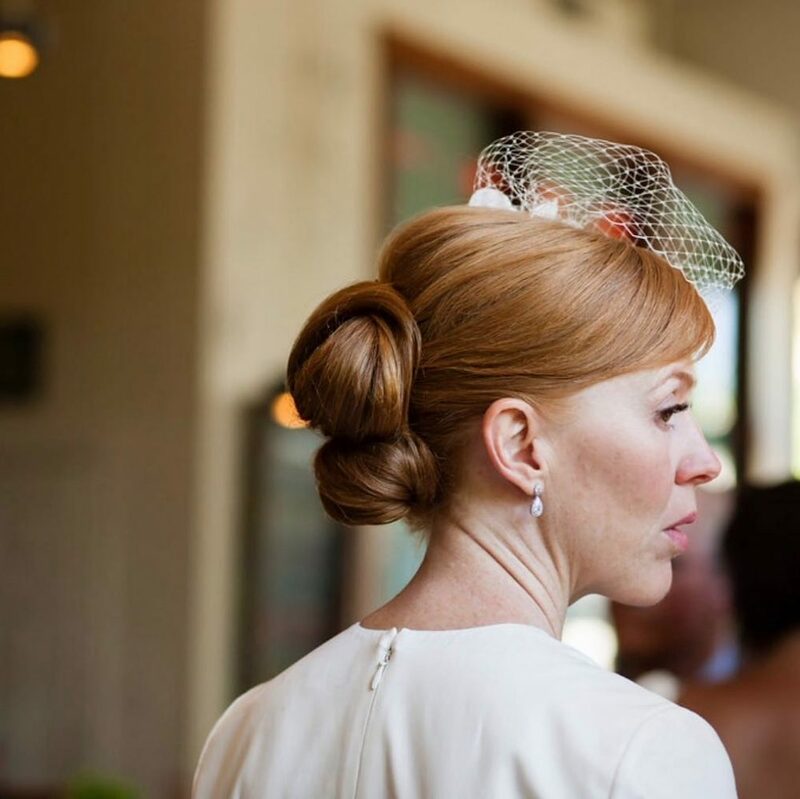 These stunning wedding updos are just what you need to celebrate your memorable occasion. 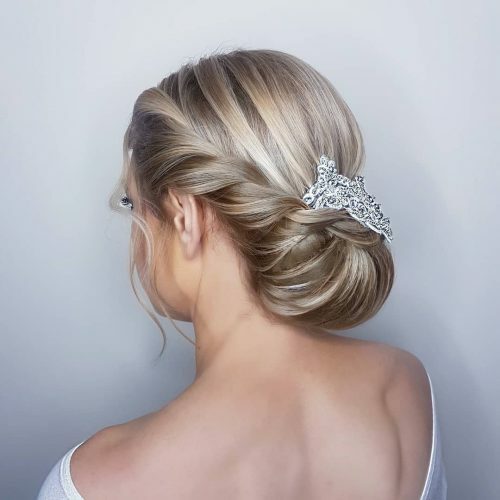 An updo is a lovely choice for a bride or bridesmaid with long hair, or if you simply don’t want to be fussing with your style. These updo bridal hairstyles will have everyone looking picture perfect without the stress of wind-blown tresses interrupting your ‘selfies’. Pin these looks and enjoy our delightful selection of beautiful wedding updos for both you and your bridesmaids. Now, get your hairstylist on the line and book your wedding hair appointment today. Then celebrate another checkmark off your wedding ‘to-do’ list with a bubbly mimosa. Congrats! 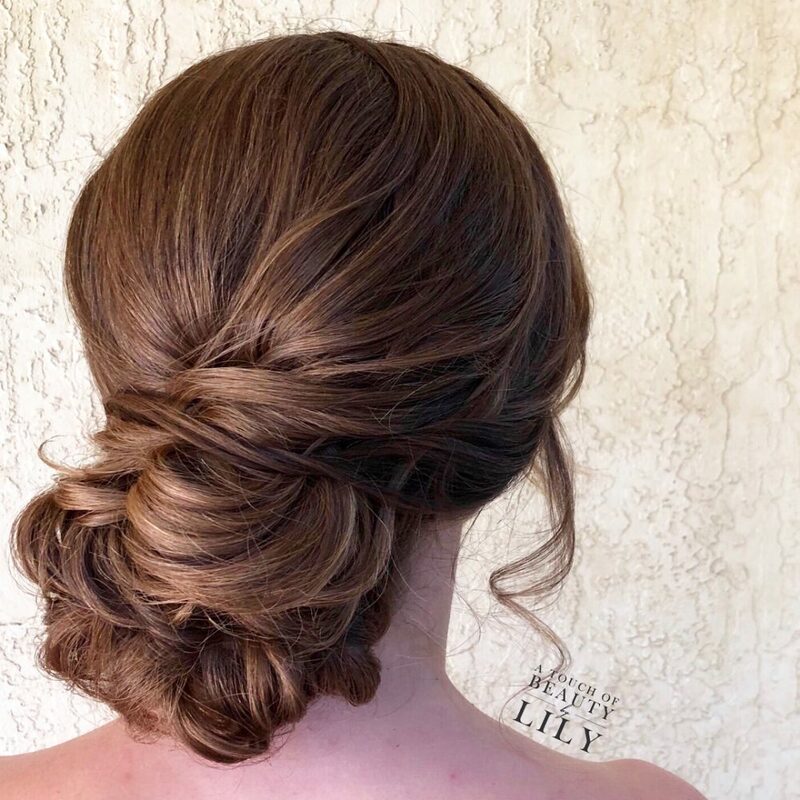 Be a modern bride and enjoy an effortless looking knot accentuated by beautiful espresso and warm brown hair color. 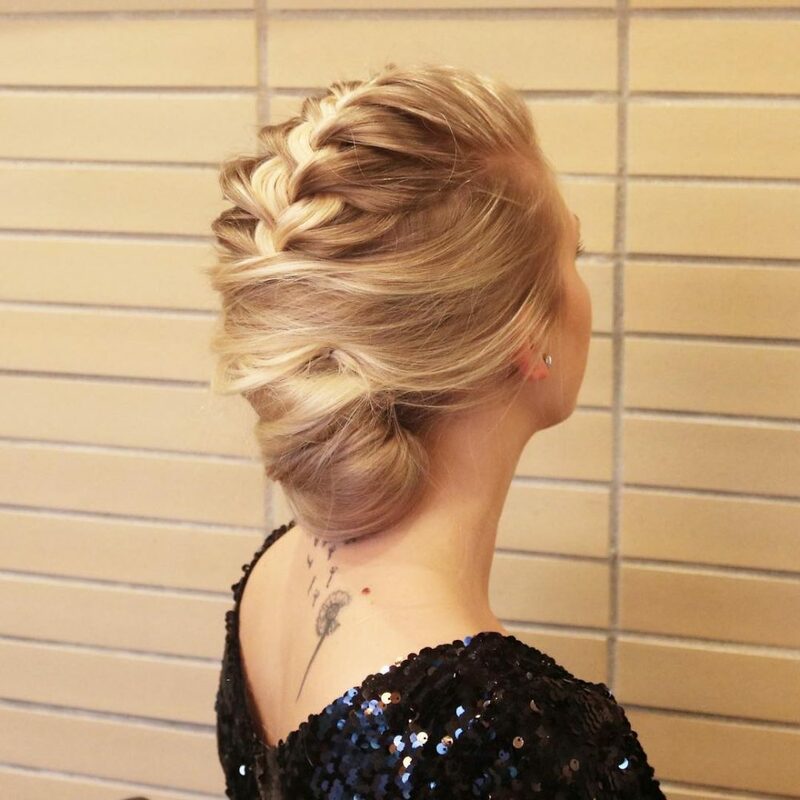 Enchant everyone with ashy blonde hair that glistens at every twist and turn in this cute upstyle. Perfection doesn’t have to be complicated. A soft and simple yet elegant low bun accessorized with a pretty headband would make for a gorgeous bridal updo. Highlight your oh-so enchanting braided wedding updo with with cute floral details for a more beautiful look! 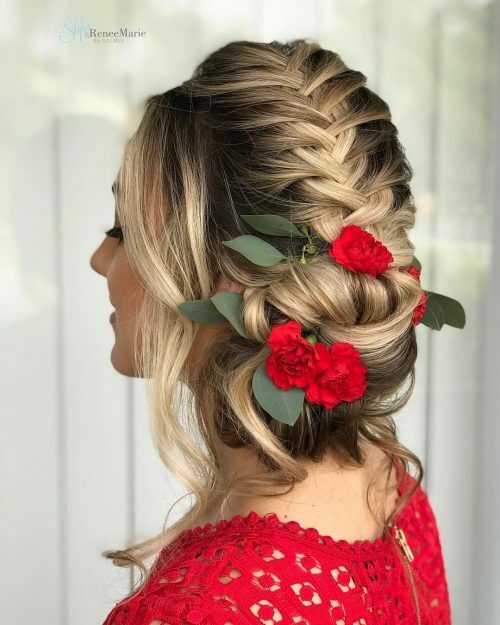 This one features a super romantic braided updo that starts on top with a loose French braid and ends in a desirable bun decorated with flowers. Leave some pieces of hair in front to highlight your pretty face. Messy in the right places – this loosely done hairstyle looks so magnificent with that simple braid that holds it together. 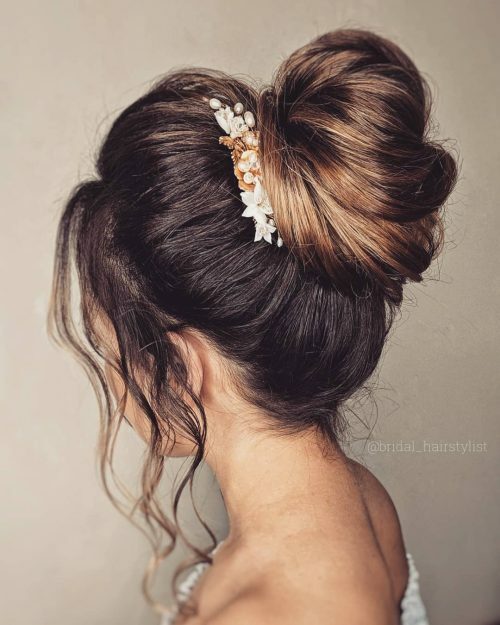 Leaving some loose wavy pieces from the low bun makes it a classy and fun look at the same time! 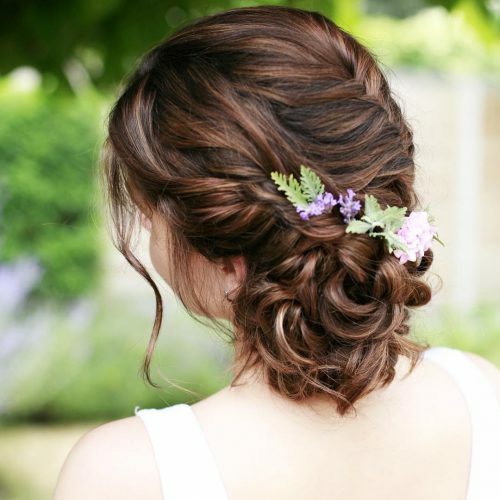 Make your dream wedding come true with this totally cute hairstyle! 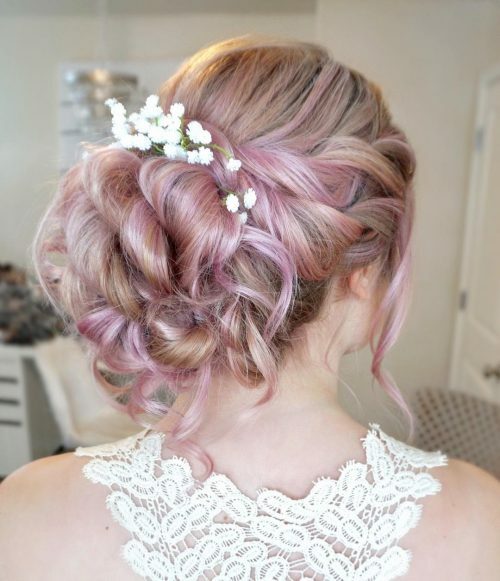 The enchanting pastel pink with peach undertones give the bun a fun and edgy look. I would describe this style as a romantic, undone pull-through braided upstyle. My favorite part about this about this style is the pull-through braid. 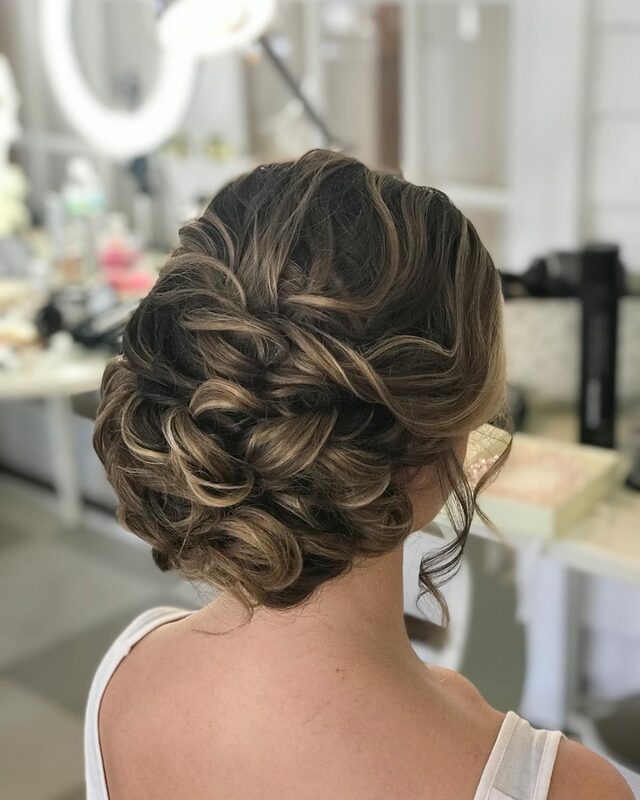 I feel like you typically don’t see a pull-through braid in a bridal upstyle. The size of the braids on either side and the undone bun the in the back give it a romantic, boho vibe. If you love boho style or love braids, don’t be afraid to get a pull through braid on your wedding day. I made this type of braid more romantic by creating two small pull-through braids. I then wrapped both braids around the top of an undone bun in the back. The hair type I recommend for this style is fine/medium hair texture but with = a lot of density. Some styling products that would help you recreate this style would be a light finishing spray, small elastics, dry shampoo, a 1-inch curling iron, and a dry texture spray! I would describe this look as a 1960s-inspired double chignon. My client showed me a picture of Britt Ekland, but she didn’t want to use extensions or a fall extension. If we did, her chignons would have been more substantial in fullness. In the 1960s, ladies used hair fall extensions and wigs all the time. This is for a classic client that wants a timeless look that is modern yet envelops a retro feel. She needs to feel comfortable having her hair away from her face. Hair length needs to be below collarbone with medium density. The look works best if the client bangs/fringe. Extensions can be used if the client needs either length, fullness, or both. Styling products and hot tools most definitely need to be used. I used all Bumble and bumble products: Prep as a foundation product, Thickening Hairspray as my structure product (blow dried into the hair), Does It All Hairspray as my working spray, Semisumo as my detailing product, and Extra Strength Holding Spray as my final setting spray. I will describe this look as a clean, soft, and classy wedding updo. My favorite thing about it is the fresh flower hair accessory that I made. My advice to a client who wants this look is to simply tell their stylist what their personality is like so they can create a suitable look that fits them well. This is a textured middle height bun. It is romantic and elegant with just the right amount of intricacy without looking overdone. 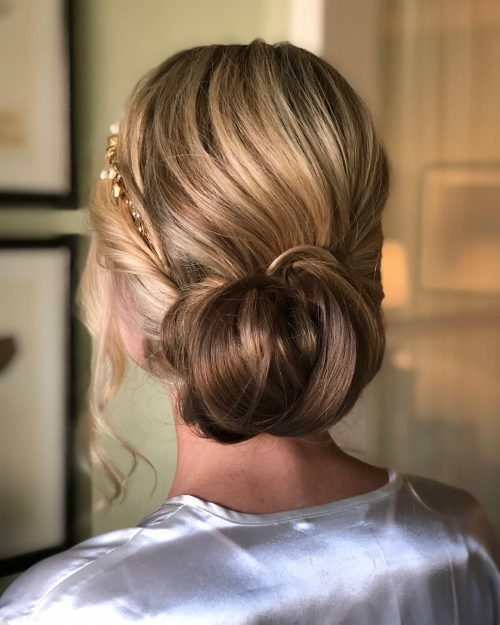 Some loose strands of hair add softness around the face, and the volume in the bun area makes it slightly visible from the front when the bride is being photographed at that specific angle. This updo is super comfortable, very flattering, and it photographs well from all angles. If some strands of hair come undone during the hecticness of the day, that is ok! This hairstyle is not meant to be perfect. 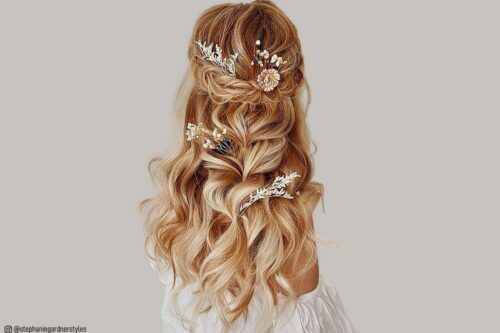 This hairstyle would be a great fit for a bride that loves lots of texture and someone who likes a perfectly imperfect hairstyle. It is ideal for the bride with a playful yet elegant personality. The bride in the picture had naturally curly hair that she shampooed, conditioned, and allowed to air dry. I used a 1-inch curling iron to enhance the curls, then pinned them up and sprayed Aquage Finishing Hairspray. I allowed the curls to cool off in order to maintain the volume and texture. Once the bun was completed, I used Sebastian Shaper Fierce for a stronger hold. This hairstyle is perfect for brides that have medium to very good density in their natural hair. For brides with very thin hair, the use of extensions might be needed in order to achieve fullness and to help the style last. Color is very important! The bride in the picture had different tones of highlights in order to be able to appreciate the texture she wanted to achieve. If the color is too uniform or dark, it would not have the same effect. I would describe this look as messy but put together, with the possibility to fit any woman’s style! What I love most about this look is that it can be done on anyone for any occasion. This could be worn for a casual day at work, a date night out, or as a style for your wedding day! It’s a simple look that can easily be glammed up. If you want a hairstyle that makes you feel great, is pulled back from your face and is comfortable for a full day of activities, then this would be a great option for you. The braids keep your hair up and in place, but they are loose enough that you won’t feel like your hair is being pulled back too tightly. To achieve this look, all it took was a brush through, some elastics to tie off the braids, a few bobby pins, and some hairspray. There are minimal products required and this is a quick look to achieve. So for a busy woman on the go, this is a perfect style! Another bonus to this look is that it can be done with any hair type. So whether your hair is thick, thin, fine, or curly, you too can achieve this look! This is an “undone done” look which is really in right now. You see similar looks on the runway where the hair is slightly flyaway and whispsy, but has an elegance to it. The look is really natural and I love the softness it can bring to a bridal look. A dry aerosol hairspray and salt spray is highly recommended for this look. I used Aveda Air Control hairspray and Aveda’s new Texture Tonic salt and sugar spray. Most brides that I have had that ask for a look like this generally have a freeflowing look or theme for their big day. Farm weddings, beach weddings, etc. This look is also very versatile for any hair types. I love this hairstyle! I feel like this hairstyle portrays a powerful, confident woman who commands the room. 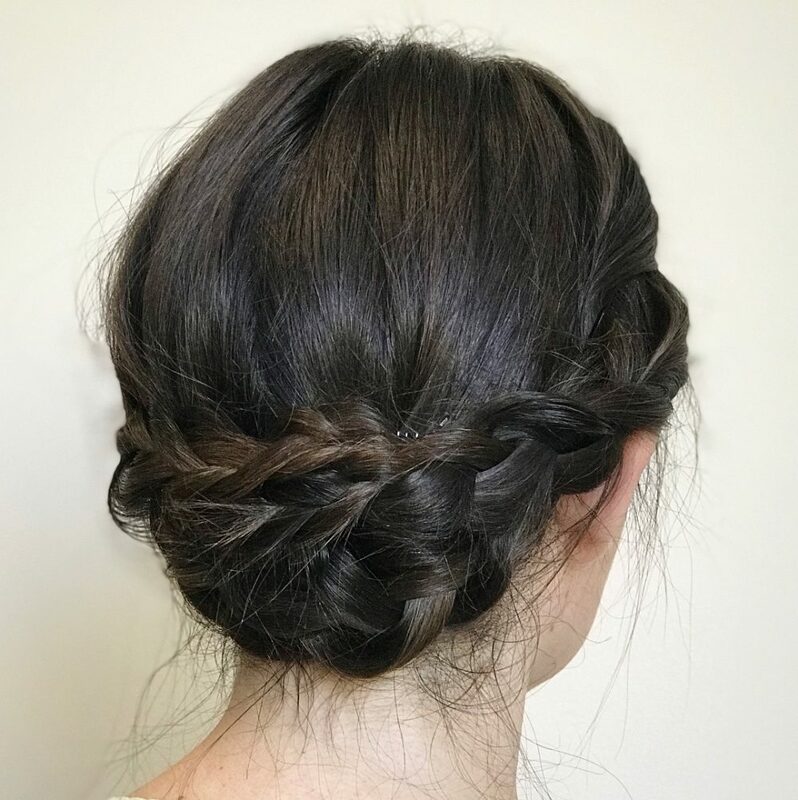 The style I created is an elegant upstyle French braid with a French twist. The structure of the braid and the volume on top are my favorite things about the style. I love how softly the side parts flow into the French twist, making it more modern but still elegant. The best tip I can give you is to prep the hair! I used a 2-inch curling iron to get the much needed volume. After that, I used dry shampoo from Kenra on the roots and a little bit into the middle section of the hair to get a good grip. Next I divided the hair into three sections: top section (braided part), sides and down section (French twist). With the help of a clear elastic band, I French braided the top part and used a root lifting powder mist (Puff Me from Design Me), pulling the the braided hair out and up to get the volume and the structure. On the down part, I created a French twist with a lot of teasing and some bobby pins. At the end, I used Kenra’s medium hold hairspray again bobby pins to let the sides flow into the style. Finish it with hairspray and it will hold all day and night. This hairstyle is best for clients with medium to medium long hair. Medium thickness would be ideal, but if the hair seems too thin you can always add some clip-in extensions to get the volume you need. Barefoot Blonde Hair has amazing hair extensions! My model in the picture had medium/thick hair which was perfect for volume of the braid and the teased French twist. An oval shaped face is optimal for this hairstyle. If your client likes volume on top and an elegant look, this style would be perfect for a variety of occasions! It really is a versatile hairstyle. I would not recommend this updo to someone with a high forehead since the volume of the braid would add more to it. I would describe this look as an intricate and romantic low chignon. One of my favorite things about this style is the color of the client’s hair. When looking for an undo, it is very important for the person to stay true and realistic to themselves. If one has dark hair, details will not show as much as someone with light colored hair. 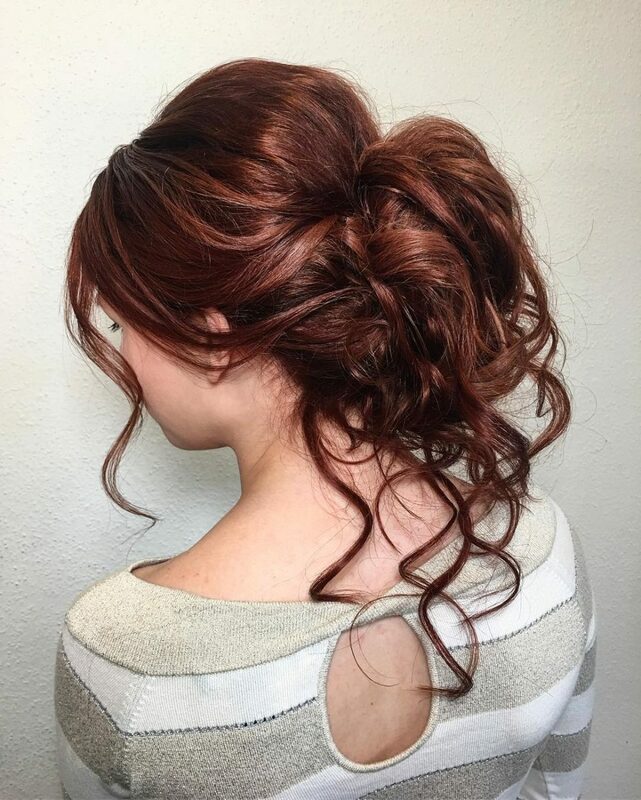 This client in particular had a reddish color which really showed the intricacy of the updo. I also lovebthe twists and waves and how they meet in a soft, effortless way. It is always easier to create updos on textured hair which is why I always prefer that clients to wash their hair the day before and not use much conditioner. You don’t want the hair to be too silky as that will take longer to style and fall apart faster. My favorite products are by Kenra and Redken. I use Kenra Volumizing Dry Shampoo all over the hair and the volumizing hair spray in #25 as I curl. These two products are great because they have a lot of grip and do not give that “wet hairspray” look. To give the textured look, I work with Redken’s Wax Spray. It is the best wax spray on the market! Once the look is complete and the client is happy with the outcome, I secure it with Redken’s finishing spray in #23. This look will work for pretty much anyone with medium length hair. 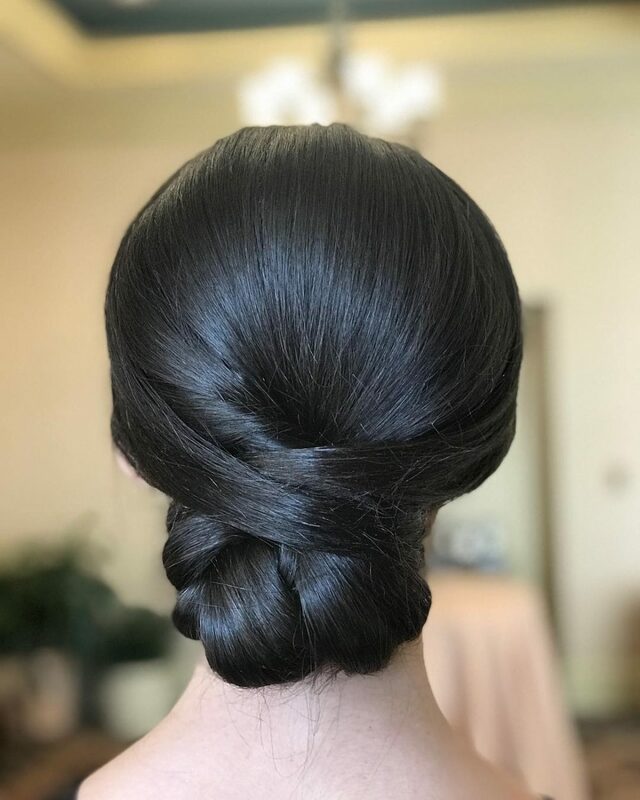 As long as the client feels comfortable with hair away from their body and somewhat away from their face, this updo is perfect! I like to frame the face with some hair to make it more romantc. I would describe this look as a simple and polished low bun or chignon. I love the crisscross detail and how shiny the hair is. It radiates elegance! Prep the hair with loose curls and use a texture spray at the roots for volume, then use a medium hairspray for hold while styling. Finish the look with a shine spray to control flyaways. This is a classic style that would look great on any face shape and work with most hair types. However, a longer hair length is necessary to achieve fullness in the bun. 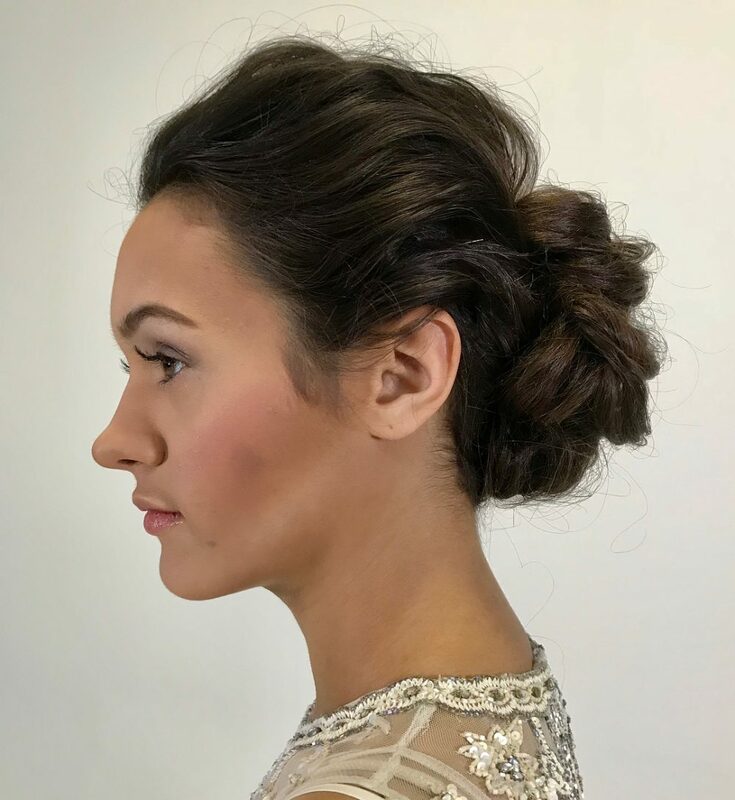 This modern updo is a loose and romantic style that incorporates a lot of added texture and volume. My favorite thing about it is the messy-but-still-polished appearance. Teasing around the crown area of the head is an important part in recreating this tousled look. I pumped up the volume with Beyond The Zone Rock On volumizing powder. I also used Kenra Dry Wax Spray 5 and Perfect Medium Hairspray 13 to create shine, texture and hold while curling the hair. Pinning larger sections of the hair upwards will help to create a voluminous bun. Clip-in extensions were incorporated here for extra density. This style is perfect for anyone seeking a soft and effortless updo for any special occasion. Volume and texture are two things that are always customizable. It’s ideal if the client has medium-long hair for this look.